Weekdays 8 to 6, Saturdays 8 to 12. Your other family doctors! The very best technology in a small-town practice, providing superb medical care for your pet throughout a long and healthy life. 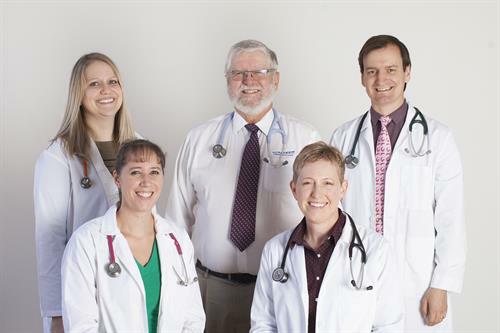 Dr. John Baillie, Dr. Noemi Plantz, Dr Kirstin Keller, Dr Charlie Cosimini, Dr. Erika Olson and our caring staff keep your companion animal healthy and happy. Visit our website to get acquainted, or call us. Our long-time motto is ''extraordinary care for your extraordinary pet!''. All species, including dogs, cats, birds, pocket pets, reptiles, exotics, and pet chickens and ducks. Visit our website to see our good neighbor activities. On Highway 5 in old village Lake Elmo, next to Gorman's Restaurant. In the very middle of the east metro, minutes from Stillwater, Woodbury, Bayport, and Oakdale.